Southampton, Hampshire and the United Kingdom’s Favourite Fool & Funny Clown! 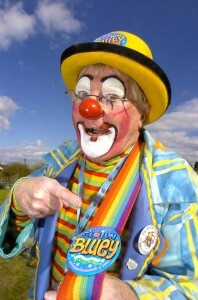 Bluey is an experienced award-winning international professional entertainer / funny clown and children’s entertainer available for all types of venues and events including Children’s Party Shows / Corporate Functions / Outside Galas & Fêtes / Shopping Promotions, Shopping entertainment, Street entertainment and Parades etc. Bluey has, over 30 years, travelled throughout the world entertaining all types of audiences from the very young at heart right up to senior citizens! He provides Entertainment at birthday parties, open days, celebrations, fairs, county shows, theatres, Clubs, Jazz Clubs, Weddings, Christenings and all events in between! Bluey will provide excellent professional entertainment for any event anywhere including Hampshire, Sussex, Wiltshire & Dorset, London, United Kingdom (or elsewhere in Britain or overseas), not just in Southampton. A lot of fun is guaranteed at this Hampshire U.K. entertainer’s children’s parties -sometimes with his funny crazy Fire Engine clown car or magic (Bluey always gets the magic wrong and children love to help get it right! 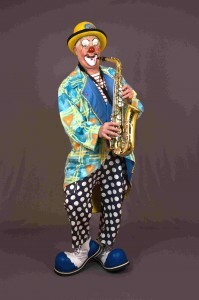 ), slapstick, music (which can include banjo, saxophone, 21 note Trueman Organ and even musical saw!). Additionally, Bluey’s entertainments may also include stilt walking, parachute games, balloon modelling / sculpturing / twisting / bending and other fun things like bubble shows and circus skills workshops (including clown, plate spinning, Devil Sticks, Portuguese Olas and balloon modelling). GMTV with Keith “Cheggers” Chegwin, 2007! Bluey is located in Southampton, Hampshire, UK and performs shows all over the UK and other countries. Bluey as a Party Clown can offer Birthday party entertainment only in Hampshire, Wiltshire, Dorset, West Sussex Wiltshire and South London. Although having never worked as a circus clown, Bluey has guest-performed for Zippo’s Circus (London, United Kingdom) and has performed in Circus Big Tops in Holland, Austria and Germany. Please see Bluey’s other pages on this website for full descriptions of available acts, and references. 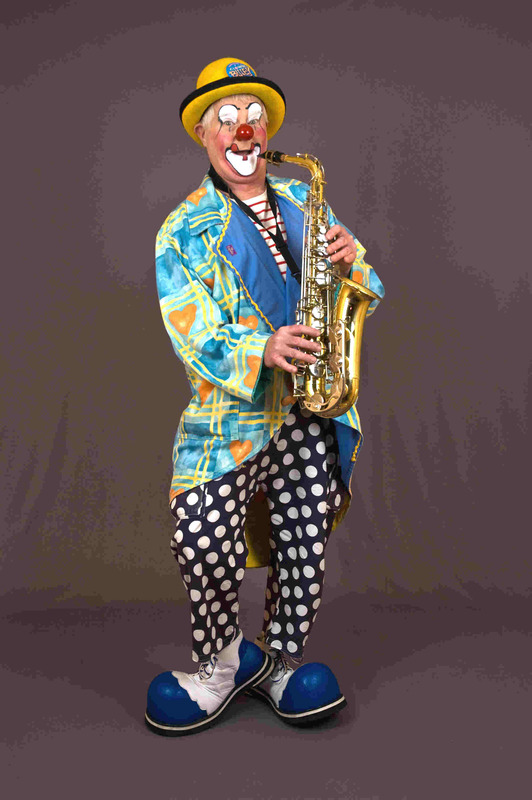 Please take a moment to browse in Bluey’s Gallery for pictures and photos of clowns! Have a look at all of Bluey’s different clown characters and clown costumes! Why not contact Bluey today and have a magical birthday party or event with the UK and Hampshire’s favourite clown? Bluey can also provide additional performers for that special event: Flossie stilt walks and is an excellent face painter. Conk performs with Bluey and together these two crazy buffoons can offer slapstick comedy, musical mayhem, workshops and general idiot silliness either in set show pieces or al fresco mix and mingle and meet and greet scenarios. Bluey also performs as “B.B.”, his non-clown character. 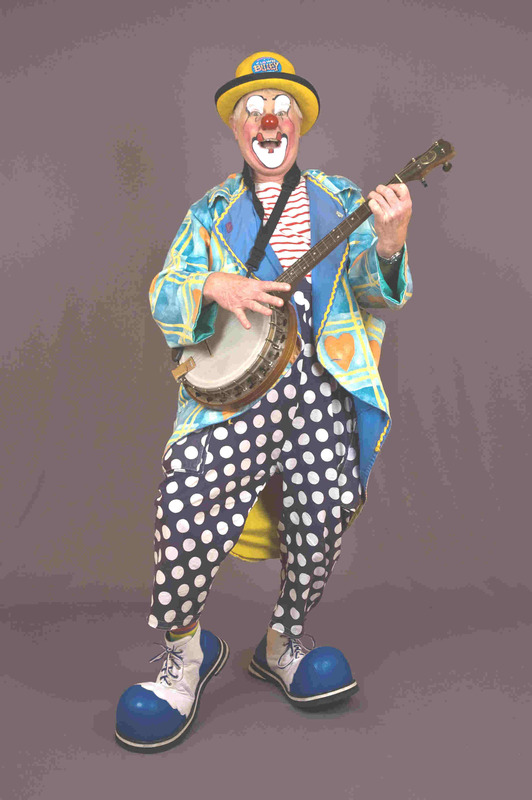 He is especially welcomed at Corporate Dinners, Company Events, Restaurants etc where a clown entertainer may not be considered suitable.Bluey is a member of Clowns International and also a member of Equity. He provides Children’s Entertainment for all ages of children as well as corporate entertainment, shopping mall entertainment and can also offer circus skills and balloon workshops, face painting, bubble shows and musical slapstick acts. His CLOWN CAR, ‘Fire 1’ in Bluey’s “Crazy Fire Engine Show” is a must for any small outside Gala, Open Day, County Show or Fête. Bluey’s Crazy Fire Engine is a favourite with audiences the length and breadth of the U.K. and is a great draw with children and adults alike. Lots and lots of clown slapstick fun – see Bluey get soaked by numerous buckets of water by Flossie Fleabag, the (un)helpful Fire Dog (2nd Class Rough Crufts!)! ‘FIRE 1’ can also be booked for promotions and al fresco meet and greet occasions. Bluey has not only travelled the world entertaining children and adults, he is also an award-winning professional entertainer and has won numerous awards for his performing skills. He has represented Great Britain at the prestigious “Clown D’oro” in Sicily and also performed for Princess Stephanie of Monaco in the Princess Grace Theatre (see Bluey’s Awards Page). 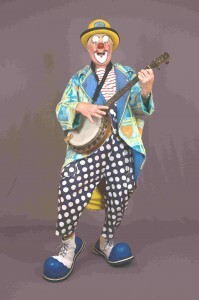 He is a member of the committee for Clowns International, an Hon. Vice President for that organisation and is also a long standing member of Equity. Whatever your requirements, you are sure to have a fun-filled birthday party or event with Bluey, an entertainer with many years of professional entertaining experience. Bluey looks forward to performing at your birthday party (Hampshire, Sussex, Wiltshire & Dorset areas only) and at your event anywhere in the U.K. or overseas. As a full-time professional performer, he is fully covered with Public Liability Insurance and has up-to-date enhanced CRB (Criminal Records Bureau) Registration. Please have a browse through Bluey’s extensive web site: he aims to make it fun and informative and in this regard you can find fun instructions on how to make balloon sculptures, a large section on the History of Clowns, other interesting facts, figures and articles about clowns and the circus world, and, a planned section containing individual biographies of famous professional clowns of the past. Like Poetry? Bluey has collated and published a collection of Clown and Circus Poems / poetry for your edification – some written by clowns, others about clowns or Circus – click on the relevant link in the Index on the left. For more information or enquiries to book Clown Bluey (or B.B, his non-clown persona), please contact the numbers or e-mail address at the foot of the page. If you see someone without a smile today, give them one of yours! Live simply. Love seriously. Care deeply. Speak kindly.